So, on Monday, I’m outside work waiting at the bus stop. It’s about 6:15pm and it’s a little chilly but I opt not to go into the little glass bus hut. The Canadian One reacts the way one would when his fiancée says she sees a wolf and you’re 99.99% sure it’s just a dog. He doesn’t react. I tell him to heat the oven to 350 degrees and I hang up the phone to await the bus. Having forgotten my headphones and my book, I had nothing to do but stare into the abyss, i.e. the car park of my building. I slowly start to realise the ‘wolf’ is zigzagging his way through the stationary cars in the car park. 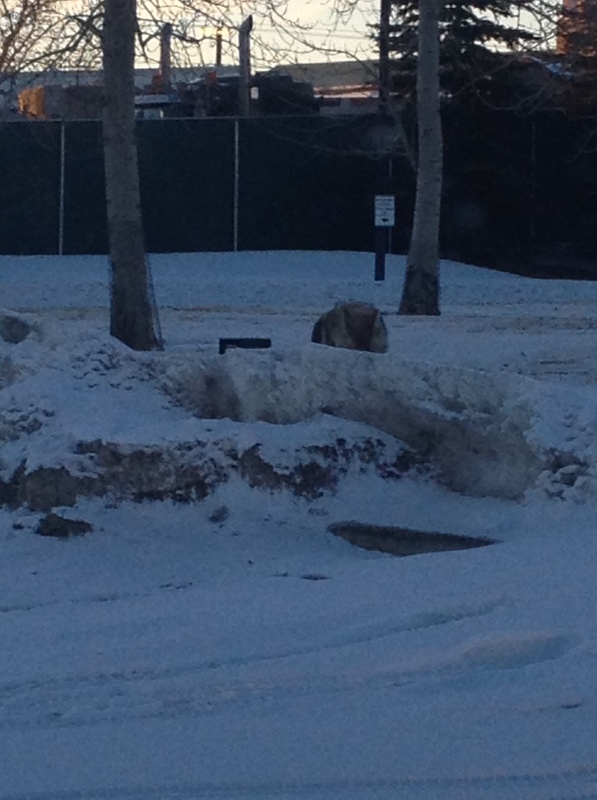 It’s looking more and more ‘wolfy’ as it stalks it’s way down the pathway of snow. A security guard appears at the doorway of my building in an orange reflector jacket, too far for me to make out what he’s doing but not too far away for me to come to the conclusion that he was doing nothing. Nothing at all. Not a Goddamn thing. There was a wolf in the car park. You know what, I’m gonna let that go. Moving on. So, I’m standing there in my giant winter jacket staring at this wolf. I’m across the street. I think, it’s not going to cross the car park, cross a busy street and attack me….until it starts to cross the car park and cross the busy street. At this point, there’s one other pedestrian on the pavement far ahead and me, standing at a bus stop, next to a glass, enclosed shelter with an open door. It occurred to me briefly to enter the shelter…then it occurred to me the wolf could also come join me in the glass hut in which case, I’d have no escape. Didn’t I read that somewhere? Or possibly seen it in Twilight? Which is, incidentally, the only reason I know what a wolf looks like. Definitely moving from the bus stop. Walking fast it is. I started walking with the intention of making it to a nearby bookstore for safety. I walked faster and Wolfy was across the street, stalking me on my side of the road. I walked so fast one could almost call it a ‘small run’, fast enough to escape a wolf but not fast enough that it would realise you were running and chase you. And then eat you. Which is what I was fast becoming convinced would happen to me. This is it. This is how I die. Eaten outside a Chapters by a rogue wolf. I came to a stop light and had a decision to make. There was a car and a truck on the opposite side of the road making a right turn. Do I cross or do I stop? Hit by truck or eaten by wolf? I was not enjoying how my Monday was progressing so far. Luckily, as I my foot hit the road and off the pavement, the light turned in my favor and the truck (not the car, mind you) stopped and I ran across the road while Wolfy veered into a bush. I panted my way to the bus stop, hailed the oncoming bus and hopped on. Five seconds between road decision and seat on the bus, not bad. I COULD HAVE BEEN EATEN. Turns out she was chased by Wolfy to her car where, while on the phone to her mother, she dropped the phone while scrambling to get her car open. Naturally, her mother thought she’d been attacked but luckily, there was a bunny nearby that caught the wolf’s attention. Obviously I mean lucky for my friend. I showed the picture to The Canadian One and he admitted he thought I was joking on the phone. Just goes to show, when your fiancée says she sees a wolf in the car park of the building where she works, you should believe her. This isn’t the girl who cried wolf! And no, I have no idea what happened to the wolf but I did eagerly check the Metro on Tuesday and there was no reported Wolfy activity as of yet. I, Shanti11, am Catherine from work, and because if this wolf story, I am an avid fan, and a new follower! Catherine! From work!! DON’T trust Carah from work…just sayin’…she’ll have you eaten by a wolf if you’re not careful! Or a coyote! Either way, she Will abandon you I’ve heard! She WILL! In a zombie attack, she’ll be the only one to survive but not rescuing the others. You watch.